Nice TV, great picture and sound but like a lot of Toshiba products, has built in defects that come out with time. For example, the IR sensor that works inside the TV with the remote control CT-90087 stops working. Very unhappy with that along with the lack of support from Toshiba in letting you know what the part number is or where to get this IR sensor that is inside the TV. Come to find out that most all of them have this defect. Easy to use. Color and sound is good as well. My Toshiba 36HF71 got broken only within a year and half. It is too heavy to bring in to the repair shop by yourself. According to the repair shop, it is very common problem. In-Home Repair fee will be at least $300. Therefore, I recommend to buy extended warrenty if you buy this product. Performance itself is very good but has problem in reliability. It is too heavy to move, so that it is hard to change the location of TV in the room once you set it up. Picture and ease of use. There is no mysterious white line! Lighter than the XBR, it is amazing the technology put into this HDTV to give it a better picture and weigh 25+ lbs. than the Sony XBR. This HDTV is the best value in it's class. I sought for the best possible 36" HDTV for my money. For months I would compare models of the Sony, Panasonic, and Toshiba. After annoying the heck out of the sales clerks at Best Buy and Sound Advice I chose the Toshiba. The picture is excellent as well as the ease of use of the menus, very straight forward. As for the remote, nice layout and large buttons as well as a backlit feature make this one of the best. You can not find a better 36" HDTV in this $$ range. Nothing in the realm of HDTV. Impressive DVD picture, adequate NTSC picture on normal TV. OK sound. Mild red push, I could live with it. Thankfully Best Buy has a good return policy. The above, and it's got slippery feet, almost knocked it off my stand. Unit marked "assembled in USA", which means an American screwed on the rear cover, bypassing import duties. Where was it made? Ask Toshiba. Too bad you can't see people blush on the phone, but the lengthy silences will clue you in. And while you may not tell from this review, I really wanted this TV, I just wanted it to be right as well. This is not a professional product. Service answers the phones quickly but was of little help. Best Buy employees are not old enough to vote, let alone drink. Ask them about line doublers, watch their heads explode. 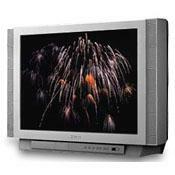 Display model had vertical noise bars when viewing channels 2 to 6. Home unit had the same problem. Same model at a different store has the same problem. Using the Avia setup disc vertical color bars were quite bent, like upside question marks. Setup menus poorly designed, masking most of the screen while using the Avia disc. Velocity Scan Modulation can not be user disabled. Poorly engineered remote. Weighs about 25 pounds less than a similar Sony XBR, one has to ask themselves why. Returning to my 26" Mitsubushi with SVHS input. Moved the seat closer to the screen. Made popcorn, plan on waiting till they get it right, or Hell freezes over. Very effective linedoubler. Very impressive picture.